Mix corn flour, salt & water to make a medium batter. Dip the mushroom in the batter, deep fry in oil and keep separate. Heat 2 tsp oil in a pan, add ginger, garlic, green chilles,onion sauté until they are sweat. Add all dips (sauce) & add the deep fried mushroom. Finish with cilantro & spring onions. 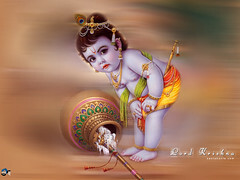 thxs for ur comments from raaji & ramya..
Hi raaji.. no food colour dear..
this is soooooooo tempting, Srikar. 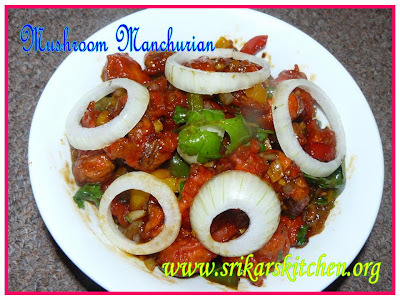 a new idea of making mushroom manchurian. its color came out perfect and the way u presented is good. nice entry for the event. I love mushrooms and this looks so yumm. Just one question, when you fry the mushroom do oil get splashed every were. WOW mouth-drooling entry dear, manchurian looks gooooood!!! I don't mind eating mushroom this way, looks delish. Welcome Anu! !thxs for ur comment & Dear all thxs for ur valueable comments.. Happy cook- u r rite dear..when we fry the mushroom, oil get splashed every were.so be careful..but this taste is really yummy.. my hubby only likes mushroom. i dont like it. but i tasted , it was really good. That does look amazing... lovely presentation. This is my fav. Look so good. Love to have it with fried rice. Lovely presentation. YUM! looks yummy..have only tried with cauliflower..have to try mushrooms and corn..
Mushroom Manchurianlooks amazing... lovely presentation sripriya:). spicy and delicious.I agree with the others on the rich vibrant color. I;ve never tried manchurian with mushroom before but that looks just perfect & gorgeous!